I am a fan of magazines. Most millennials likely don’t share my passion for print magazines, but I believe there is a compromise that can please all of us: digital flipbooks. Digital flipbooks are static PDF files compiled into a magazine format for devices such as iPads, desktop computers, smartphones, and laptops. So, instead of a static web document, the user can interact with your PDF document just like they would a print magazine. The array of features from there is what separates the average digital flipbook software service companies from the exceptional. I’ve used most of the leading digital flipbook companies, and Bote.com has proven itself to be a pioneer. Let me explain why. Anyone who has ever run a web service or website from the ground up has probably experienced the nightmare of under-equipped hosting companies. Many hosting companies are a bunch of computers bunched together in a relative’s basement, but the customers have no clue what is serving as the foundation of their business. About a decade ago, a little company called Amazon realized that the internet commercial market needed a reliable hosting service that could serve any customer need, and provide 99.99% uptime. 10 years later, AWS is the gold-standard of reliable web hosting services. Bote.com uses AWS exclusively for all of their clients. That means your content is nearly always accessible from anywhere there is an internet connection. This fact may seem insignificant, but the amount of customers that online businesses have lost since the internet was invented because their website didn’t load is in the millions. So, the fact that Bote relies on AWS immediately cements their reputation with me as a serious company. Do You Know 150 Million People? Bote clients include huge industry giants such as Disney, Coca-Cola, and Nike. Corporate kings don’t mingle with publishing companies who have no reach. 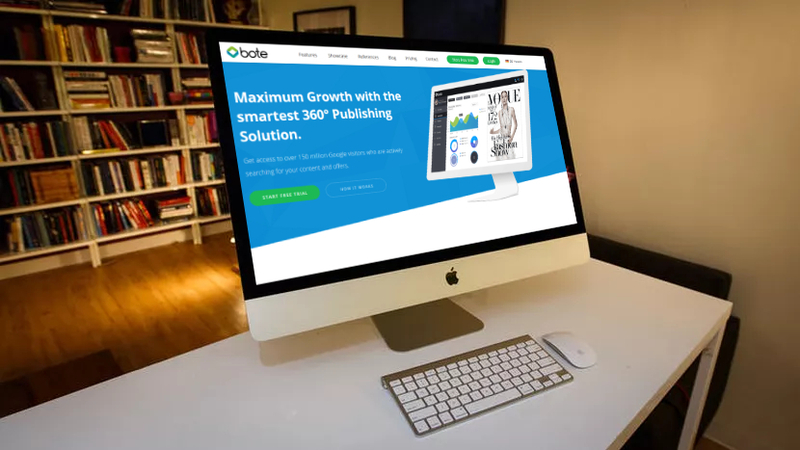 The minute you publish your digital flipbook with Bote, your content is exposed to the equivalent of roughly half of the population of the United States of America. That kind of exposure can change your life. Normally, self-publishers need to be both publishing and marketing experts to be successful. Bote takes care of the marketing aspect for you. Their community of readers, customers, and leads generate more than 150 million unique views annually. When you upload, edit and publish your flipbook to Bote, their software extracts the content from it and optimizes it to rank in Google and other search engines. So your flipbook shows up in Google as regular web content instead of just a PDF. This is a big benefit for you because regular PDF always takes a back seat in ranking to normal web content. You want frequent organic search engine traffic to your flipbook, and Bote delivers that to you automatically. Your document, when uploaded to Bote and published, is viewable in HD quality for any device. Many customers who read flipbooks use iPads. Some people use their laptop. Others use their desktop computer to read your flipbook. And of course, a large portion of your viewers will access your flipbook through their smartphone. The good news is that Bote adjusts and optimizes your flipbook automatically to look great on every one of those devices. WYSIWYG editors revolutionized website design years ago; it turned any average Joe who could use a mouse into a website designer. Bote has taken the same approach to PDF flipbook publishing with its patented Exklusiv PDF flipbook editor. Everything in the editing stage is drag-n-drop; including videos, images, and graphics. However, if you are a little obsessive about precision like me, the editor gives you the ability to align elements down to the pixel. Bote is a company that uses something called a “white label solution”. What does that mean? It means that multiple brand-name software companies have given Bote permission to incorporate their software into Bote’s products for you to use for free. One of those products is Google Analytics. Once you publish your flipbook, Bote tracks every visit, view and click that your flipbook receives. Statistics are huge in the publishing world. You need to know who is reading your content, how much time they spend reading your content, what country they are reading it from, and a bunch of other stats that help you target your content to the people who are actually reading it. Without analytics, everything is just guesswork. Thankfully, Bote has eliminated any guesswork about who is accessing your content. With Bote’s extensive following, you would think that it would cost a fortune to gain access to their readership. But you can get started with Bote for only 9 Euros a month, which is about 10 US dollars. On top of that, they offer a 14-day free trial. So, you can try it out for 2 weeks, and cancel your membership (at no charge) if you are not happy with the results. My advice is to purchase a full Bote membership and take advantage of everything they have to offer you and your publishing career. Hi, I am Thomas Bartlett. Cyclist, coffee addict, ukulelist, Eames fan and multidisciplinary designer. Doing at the nexus of modernism and intellectual purity to give life to your brand. I am 35 years old, married and I have two beautiful children.